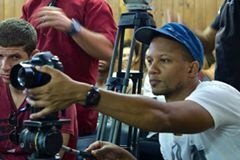 I am fundraising on behalf of Amilcar Ortiz Cárdenas, a groundbreaking AfroCuban documentary filmmaker and member of the Red Barrial Afrodescendiente (Neighborhood Afrodescendent Network) in Cuba. He's been accepted to the Gallatin School at NYU and has been awarded the prestigious Gallatin Dean's Graduate Scholarship. However, it does not cover his full tuition. for a career in Art / Media in my own country, as well as worldwide. I know that money can be tight, so please know that even $ 5 help me get closer to my goal! Let me know if you have any questions and I'll be happy to answer them."